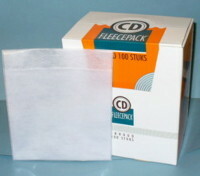 CD FLEECEPACK- BOX OF 100. An unbreakable, space-saving (75%) sleeve with three compartments. One fleece inner sleeve for the disc, one for the booklet and one for the bottom card. Plus an index strip. No cutting needed. Can be used horizontal as well as vertical.